Baby Boomers and Beyond: Facing Hunger after Fifty explores the circumstances of older adults and their households who utilize Feeding America’s network of food banks. 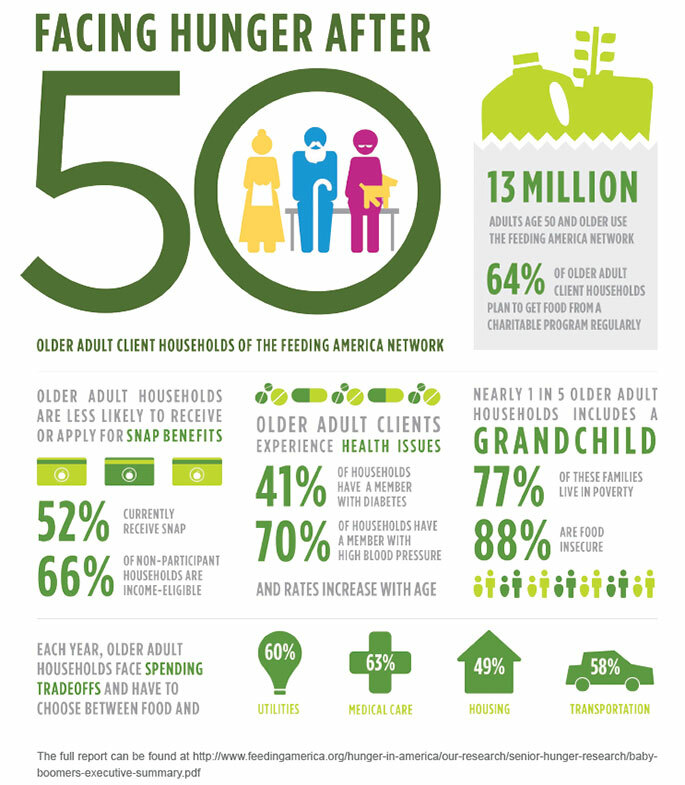 Using data from Feeding America: Hunger in America 2014, the report expands the traditional definition of senior to include the adult population aged 50 and older (referred to as older adults throughout the report) and examines the nuances within the various age brackets. Overall the US population is expected to grow from 319 million in 2014 to nearly 400 million by 2050. While the number of adults aged 65 and older is expected to nearly double by 2050, due to increased life expectancy and decreased fertility rates, the proportion of older adults will increase from approximately 15% of the total population in 2014 to more than 20% by 2050. 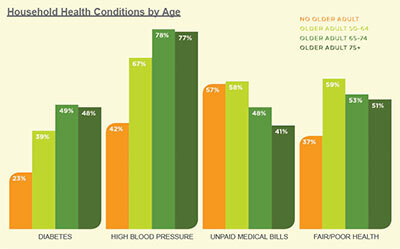 Older adults face several challenges which are detailed throughout the report. For example, because increased age is a risk factor associated with numerous chronic health conditions, older adults need medical care at higher rates and their healthcare costs can be three to five times that of younger adults. And, with decreased earnings and limited retirement savings, this group relies more heavily on fixed incomes from Social Security or Supplemental Security Income benefits. In fact, at least half of the total income for 65% of adults age 65 and older comes from both types of assistance mentioned earlier. Although proper nutrition is important at all stages of life, it can be critical to older adults for maintaining health and well-being. Circumstances, such as limited income can force tradeoffs between food and medicine and those with disabilities or impaired mobility may have even more difficulty accessing them. While health struggles and employment obstacles may face older adults at all ages, there is little research on the pre-senior population ages 50 – 59. Despite facing these same challenges, pre-seniors are not age-eligible for federal programs like Medicare and Social Security. 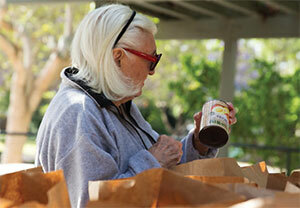 Older adults also employ various coping strategies to supplement their monthly food budget. The most common strategy is to purchase the cheapest food available (77%), even it if is not the healthiest option. Additional strategies include receiving help from family and friends (46%), watering down food or drink (38%) and selling or pawning personal property (29%). A full 24% of households with an older adult also grow food in their own home garden or community garden to help reduce overall food costs. Meeting the needs of the vulnerable older adult population will require a collective effort between charitable food programs, social service providers, advocates and policymakers. Locally, Terre Haute Catholic Charities Foodbank, which serves seven counties in west central Indiana, reaches more than 10,500 individuals over the age of 50 and while we know this is a significant number it too is likely to become more challenging. As we age our needs change and a focus on our nutritional requirements often times impacts our health, physical activity and our mental attitude. There are challenges to be sure as we have seen an increase in diabetes, high blood pressure and heart disease among our older population. This puts a greater emphasis on the nutritional quality of the food choices we are making and the methods we use to prepare food. Inside this newsletter we have provided highlights from the full report that includes details you may not otherwise know such as 41% of client households have a member with diabetes and 70% have a member with high blood pressure. Did you know that 1 in 5 older adult households includes a grandchild and that 77% of these families live in poverty? If you know that, then it might stand to reason that 88% of these client households are food insecure! So how do we solve these problems? After you read this newsletter I would encourage you to look up the full report and read it, at only 23 pages it won’t take too long and it contains information that will give you great insight as to the depth of what we are facing. I would also ask you to get involved, at your local pantry or soup kitchen, or talk with your state or national representative about how they can support senior feeding programs such as the Commodity Supplemental Food Program (CSFP) which helps get food to older adults who need it. The more you know, the more you can effect change and alter the course we are heading. We cannot stress enough the importance that getting informed and involved in the process can have on the outcome of this important issue. Choose today to do something amazing! Share your time and talent with us as a Foodbank volunteer! Call (812) 232-1447.